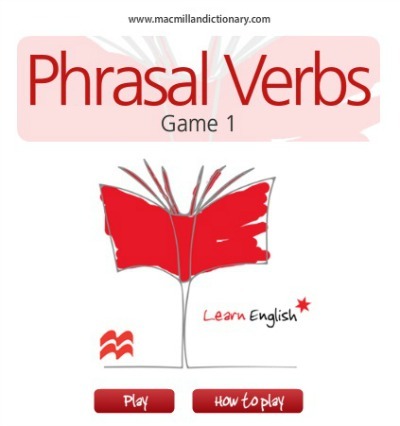 Well, because I found the word game I’m presenting to you tonight, let me break our series of lessons for expressing various feelings, so we can use this lesson to learn about phrasal verbs. This is a huge section of the verb category in English grammar and mastering it will need some learning. Once you get to that stage, you won't be sorry, that's a promise! Anyway, you can start with the game below. We call the combination of [a verb + a preposition] 'a phrase', hence the expression 'phrasal verb'. 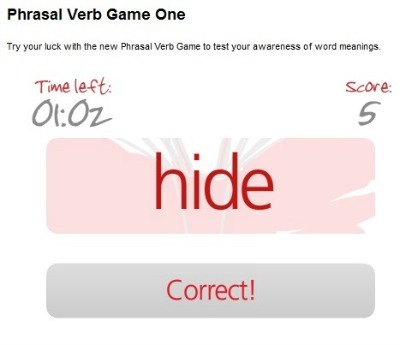 Now, you need to make a distinction between a phrasal verb and a prepositional verb. ‘To look into’, meaning ‘investigate’ is a phrasal verb, because ‘to look’ means something and ‘look into’ means something else. 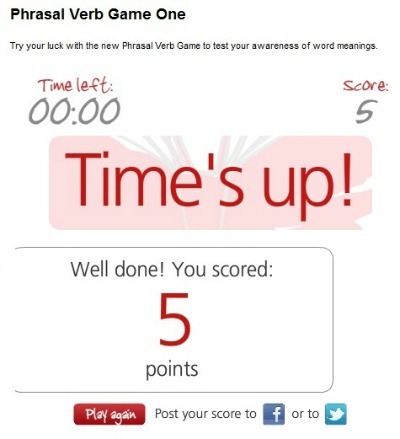 So, as you can see, adding the particle ‘into’ to the verb, its meaning has changed. However, the verb ‘to look at’ (somebody, etc.) has the same meaning as the verb ‘to look’, which is the sign that this is a prepositional verb. For a better understanding of this grammatical matter, I suggest a future lesson, in which we can also look at some examples, for clarification. • SBI! Action Guide is the written and video versions of the Action Guide, which is the SBI course I’m sharing with you here. It’s the course I studied on my own, in order to write this website and others in the future. • SBI! Forums RSS Feeds: with a one-click subscription to the "Latest SBI! Forum Posts," "Ken's Forum Posts," the "SiteSell Affiliate Program Manager's Forum Posts" and the "SiteSell Facebook Feed" I can keep informed of other SBI website writers, as well as the system’s professional technical support staff. • Tips 'n Techniques HQ: This is our one-stop center for new ideas, discoveries, strategies, SBI! Forum pearls, etc. • Monetization HQ: a collection of ways to monetize our PREsold traffic. • Monitor It! : Here we keep track of everything that's happening in our niche, or any other topic of interest for web design. • Google Unified Study and Report: This is the Google report about how to recover our website’s traffic and maintain it high. • Search It! is the most valuable information search tool in the world, for managing the context of our website, blog development, links into and out of our website, etc. • SiteSell: The Blog: Here we can find tips, information and case studies of successful SBIers. • Resources HQ: This is the place for third-party (i.e. non-SiteSell) high-quality services, products, and resources that extend the functionality and power of SBI!. • SiteSell Professionals HQ: This is the SBIers’ personal HQ that keeps us up-to-date with the work that SiteSell Professionals can perform for us, as a service. As self-explanatory as they are, and to put things in perspective, these materials are the equivalent of the textbooks one would study at university. So, all in all, you can see the level of support that people like me, with no previous experience in designing and writing a website, can enjoy as part of the SBI system. Not to forget the people resources and a ‘family’ of colleagues worldwide, always ready to share their knowledge and experience. This is all (at this stage, at least) about the tools and the facilities one can enjoy as an SBI website designer. As from next time we shall look into how to build traffic, from a variety of sources – an activity we do in parallel to increasing the content of our website. 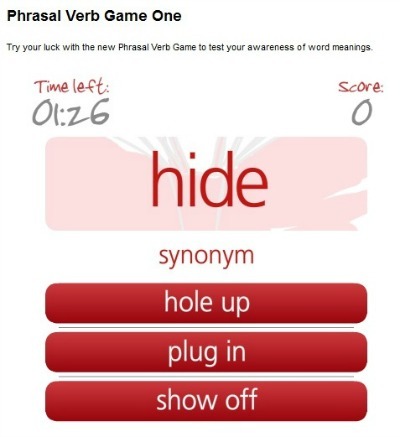 Phrasal verbs may seem obvious to native English language speakers, but for learners they can be mystifying. 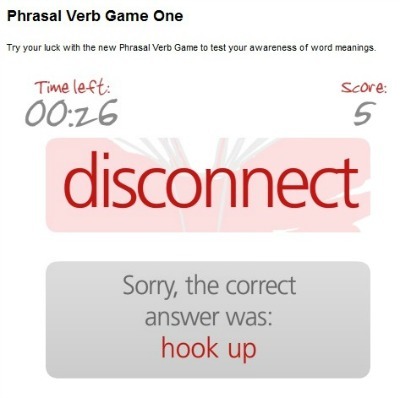 Knowing your phrasal verbs brings you much closer to speaking fluently. Here’s another example. 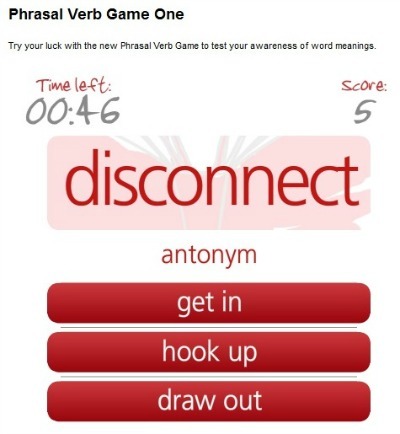 You need to observe that in this one, the correct answer is an antonym for the verb ‘disconnect’. Notice that you only get the correct choice in the confirmation window; you don’t get to see your own choice again. In this sense, I don’t particularly like the way they designed this dialogue box, because it’s easy to forget what you chose as the right answer in the first place. And to make things worse, I was even more surprised at the end, when I couldn’t review any of my choices during the game – good or bad. In the games we’ve viewed so far, we could spend some time reviewing our choices and learning from them at the end. It’s a shame this one doesn’t offer the same. Well, in any case, please risk a few minutes on it and see what you can learn nevertheless. If you persevere, you can indeed, increase your vocabulary dramatically.